The makeup in your purse...your IPOD... your Scandisk memory card—you’re likely to use a product today which was made in Shenzhen. The city is cradled at the southern border of China in Guangdong, the province in which families finalize their Chinese adoptions. Approximately one-third of Children’s Hope China orphans call this province their first home. See beyond the label “Made in China” and experience the city of Shenzhen through James Fallow’s fascinating slideshow commentary online, featuring young women working 12-hour shifts to save and move back to the countryside (2:05, 1:22) and a technology bazaar, the only one of its kind in the world (3:50). One of the fastest growing cities in the world, Shenzhen is a centre of foreign investment with outsiders supplying more than $30 billion for factory construction in the past two decades. Adopted from China as a four-month-old infant in 1995, the now 12-year-old Emily returns to her homeland on a Children's Hope Homeland Tour. "Growing up my parents always told us stories of adopted families that had adopted children just like our family. My mom and dad also told Rebecca and me that we would soon return to China to discover what our homeland looked like. In just two weeks I am planning to return to China with my family. In just two weeks we will get to go to the cities of Wuhan, Zhanjiang, Beijing, Guangzhou, and to Hong Kong." The anticipation of those two weeks has passed, and now the St. Louis family has spent their first day in China. Follow Emily's travels in country in the blog Returning to Our Homeland and see the perspective of a young woman as she sees her homeland for the first time. Anyone for take out? In a partnership that is making life sweeter for orphaned children around the world, candy store Candy Craze is donating a portion of each month's Take Out Box sales to Children's Hope humanitarian projects. In their first two months, Candy Craze has already helped 80 children in China and India. In 2007, founder Tim Bailey contacted Children’s Hope hoping to make a difference. As parents of four internationally adopted children, Tim and wife Connie Bailey have been longtime advocates of adoption and humanitarian aid efforts to improve life for orphans. In 2006, Connie joined Children’s Hope as the Outreach Director for the state of Arkansas. Tim's 22 bright, colorful and fun-filled venues can be found in malls throughout the mid-south. With all the best candy and confections for sale by weight, shoppers can buy exactly as much or as little as they wish. May 2007 - Candy Craze will purchase new clothing and shoes for 75 orphans and street children living in Kakinada, one of the poorest states in India. April 2007 - the very first gift from Candy Craze will send 5 older orphans in China to the Hand-in-Hand Summer Camp. Make your next candy purchase a Take Out and make a difference for a child. Find a store location near you or get into the Craze at www.candycraze.net! "We communicate by looking in each other’s eyes, giving hugs, with kisses and pointing,” Heidi Graser had said of communicating with her hearing impaired son Jack, home from Vladivostok, Russia in September 2006. With sign language the two communicated basic needs, but now Heidi and her son can do more. On May 8, Jack received a cochlear implant and three weeks later, it was activated. For the first time in his life, the nearly three-year-old boy could hear. “He definitely reacted when they turned the processor on and off. He even giggled when the technician built a tower of blocks with him and then knocked them down loudly,” says Heidi. At birth, Jack was diagnosed with pneumonia. An antibiotic dose error resulted in nerve deafness. Now, almost two weeks after implanting the processor, Jack is doing great. According to his last wellness visit, Jack is growing like a champ. On the growth charts, Jack has improved from the 3rd percentile, to the 15th percentile for weight and head size and to the 20th percentile for height. Having grown 2.5 inches in six months, Jack is now 27 lbs. and very healthy. To read the original story of Heidi and Jack Graser, visit their family story online or view their story “in print” in the Children’s Hope Spring Newsletter on pages 12 and 13, by PDF. Children's Hope Receives First Ethiopian Referral! Children’s Hope first referral in Ethiopia will certainly do great work in the hearts of parents Stacie and Kevin as they travel to meet their adoptive son and bring him home to Missouri. When they applied in January, the couple waited patiently for Children’s Hope to become licensed in country. Once licensed, the family received their referral for their beautiful healthy boy just one month after submitting their dossier. Now this pioneer family is set to travel in approximately two months to Addis Ababa’s Hope for Abandoned Children and Orphan Care Association, where the three-month-old infant will first be united with his family. Children's Hope looks forward to sharing pictures of this happy referral day when the adoption is finalized by the courts of Ethiopia prior to the family's travel. A big congratulations to the happy couple! Happy Father’s Day from Children's Hope! “I can’t understand most of what either of them says to me, and one of them even speaks English,” jokes Chris Crabtree of his two daughters. 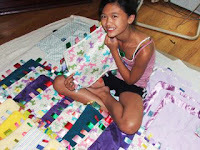 His daughter Gracie was adopted from China on Christmas Day last year. A father for the second time, Chris knows how to keep his kids laughing, day in and day out through the challenges of fatherhood. On this Father’s Day, read his story in the Children’s Hope June E-news, and also the photo journal of a naval father, meeting his adoptive daughter for the first time after his extended deployment. Feeling the heat? Read this month’s Kids Corner for kid-friendly recipes and summer crafts for long days at home...and make Dad a card-book today. Thank you, fathers, for loving, providing, guiding, praying and protecting your children all day, every day of the year. Today is yours. "Christian Dashiell was on a lucky streak that eventually earned him over 35,000 dollars on the game show Wheel of Fortune. In the end what the winnings bought him turned out to be priceless"--an opportunity to change the life for one special needs child of Vietnam. Stacy and Christian Dashiell, a Children's Hope family of Kansas City, KS, traveled to Vietnam in September 2005 to bring home Elliana. Catch this family's moving story on NBC Action News before it is no longer available online. Post updated on 12/18/07; NBC Action News link removed as no longer active. In a quarterly meeting at the U.S. Embassy in Hanoi yesterday, Children's Hope representative Thuy touched base with Vietnam adoption officials, in efforts to maintain a smooth adoption process in country. According to the government update, 780 children have come home to U.S. families since Vietnam reopened in January 2006. In April 2007, 120 children were placed. "I think this is the largest number placed in one month so far. Adoptions are really taking off in Vietnam," says Children's Hope Vietnam Program Director Nicky Losse. Representatives from the 42 U.S. agencies licensed in Vietnam were in attendance. Eight of the 120 children placed in April were with Children's Hope families. Tami Herman knew she didn't look like the other kids. She desperately wanted to fit in. So the Vietnamese dolls went in the trash. But when Herman, 33, was ready to start her own family, adopting a child from her homeland "was a given." Tami Herman smiled broadly while watching her new daughter pass from aunt to uncle to grandparent on arrival home from their adoption trip to Vietnam, May 15. Tami and her husband Jason finalized 6-month-old Olivia’s adoption from Kien Giang Province almost 33 years after Tami was escorted from Vietnam to the same St. Louis airport to be adopted by her Missouri parents. Read the AP article on the Hermans and the growing number of Vietnam War orphans returning to experience the joy of adoption for themselves. Post updated on 12/18/07 with PR-inside.com article link; Rolla Daily News link no longer active. A group of seventeen Children’s Hope families across the nation received their referrals from China today, making June 6 one of the best days of their entire adoption process! Children’s Hope has signed an agreement in Ethiopia with Hope for Abandoned Children and Orphan Care Association, a private orphanage in Addis Ababa. The founder and director of the orphanage once served at the Ministry of Labor and Social Affairs. She is very familiar with the adoption process and is well known and respected by the government. This orphanage is able to place children of all ages, even infants. In more news, the Ethiopian courts will not close in July this year, but will close August 5 for holiday. Any family whose adoption is finalized by the Ethiopian court prior to this date will be able to travel to pick up their child(ren) even after the courts have closed. These families, as all do throughout the year, will complete paperwork at the American Embassy only while in country. Although the exact date of its reopening is unknown, the courts will remain closed for approximately two months. 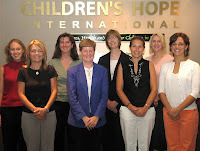 With the mailing of a document-filled CD last Friday, Children’s Hope took a major step toward Hague accreditation. A group of Children’s Hope staff worked diligently the past several months preparing the international adoption agency self-study that was on that CD. “It took hours and hours of our team working above and beyond their normal duties to accomplish this task,” said Dianna Briner, Children’s Hope Compliance Director. By the end of 2007, all U.S. agencies with over 100 international adoptions per year must be accredited for Hague — meeting the new Hague standards on international adoption. The Hague Accreditation is to establish international standards that protect the orphan and provide assurance to the adopting parents. Last year the U.S. State Department finalized the procedures for international adoption agencies to become Hague accredited. Agencies were then asked to apply and then begin the accreditation process last fall. Each Children’s Hope Hague team member gathered the necessary evidence to show compliance with the Hague standards. The evidence gathering process was made somewhat easier because Children’s Hope recently successfully completed reaccreditation with the Council on Accreditation (COA) and a ECFA accreditation. Both confirm the high ethical and financial standards of Children’s Hope.